My Card Attic: First Cards & Two Challenges! Hello one and all. I hope you had a wonderful Christmas and that the new year in 2017 is kind to us all, with health and happiness in abundance! The new year has started off better than the end of last year for us, as Mum is so much stronger than she was, she will always need a lot of support (well, she is 91 years old in a few weeks and with a dodgy heart), but thankfully, she is as good as she is going to get and more like her old self. I owe so much to all of you my friends for your words of support and thoughts and prayers during her ordeal, and she has asked me to thank you all on her behalf . . . so, thank you, thank you! This is the first cards made of 2017 and I have neglected some of my usual challenges, so here are two that I made today for two of my favourites. 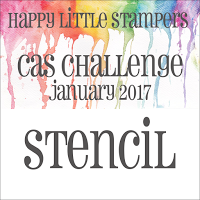 The first here is for the challenge that gave me my first shot at being in a design team, it is for the Happy Little Stampers CAS challenge that requires the use of a stencil this month. This is the card . . . a shaker for next Christmas, as I don't intend to get caught out this year! 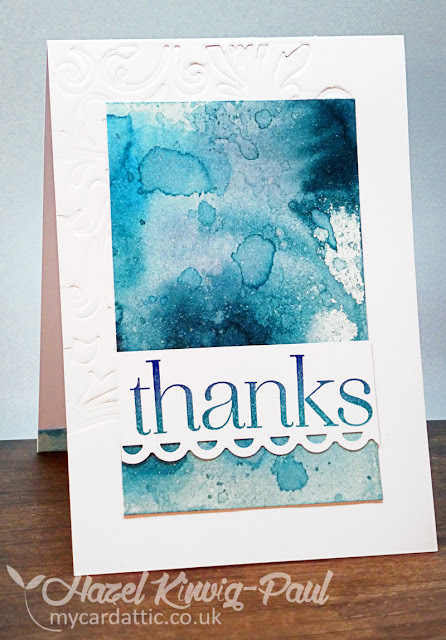 The second card is for another of my very favourites and that is my dear dear friends Loll and Bonnie's CAS Mix Up challenge which asks for, Stamping, Liquid Colours + Your Choice. 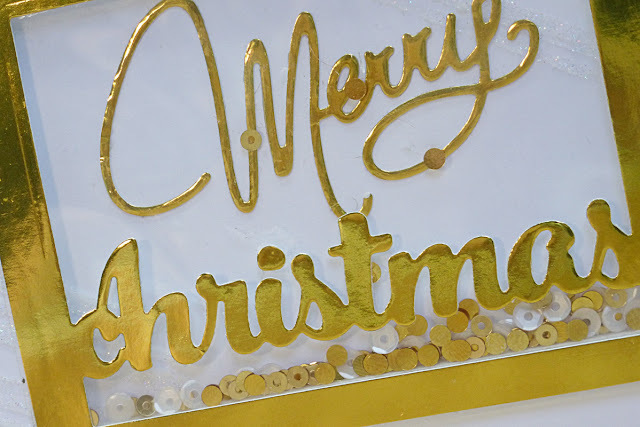 I wanted to try this technique that I saw on You Tube HERE however, I couldn't find my alcohol inks (and may never do so again, due to the appalling state of my craft room!) So, instead I improvised and used Stampin' Up re-inkers. I got a piece of watercolour paper and wet it liberally and then I dropped drips of 'Island Indigo' in spots and moved it around a bit. Then I spritzed with more water and repeated the dripping. I finished the piece, by laying it face down, once it was dry, in the residue on my mat and mopped up. I wanted to make the piece the 'star' of the show, so I just dry embossed the top left corner with a die (my choice) and stamped the sentiment on a piece of white card-stock and punched a border, then mounted it to the front of the card base. Here it is. So pretty!! 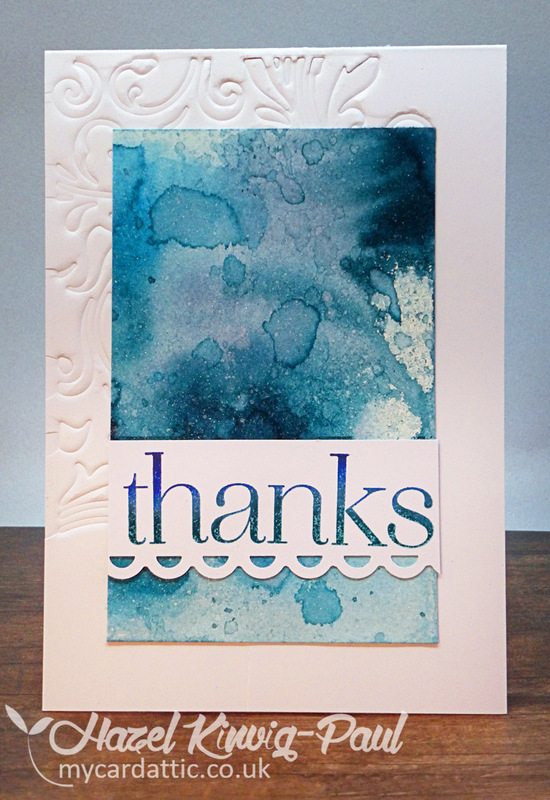 LOVE the flow of the reinkers on your card front Hazel. 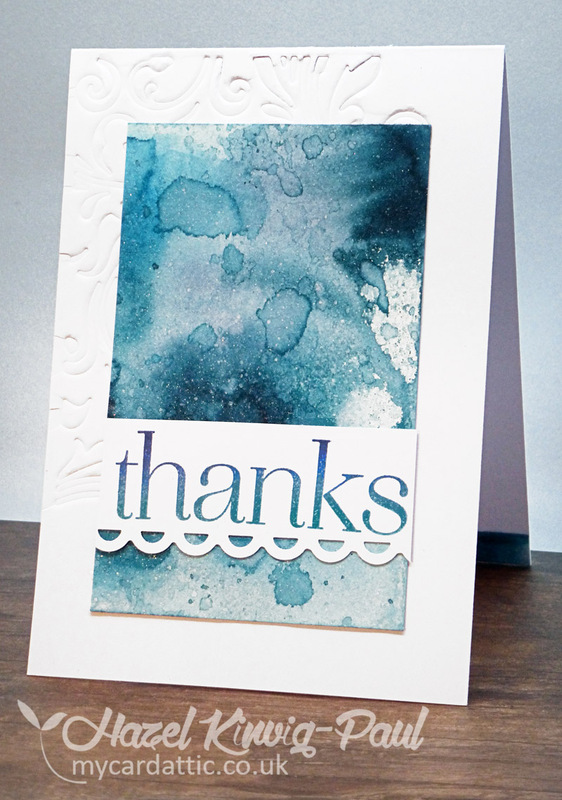 Very arsty with all the visual dimension from the splatters. And it looks so pretty again all that white ... the dry embossing in the corner is just perfect. Thanks so much for shairng with us at CAS Mix Up! You have done a terrific job of mimicking the alcohol ink properties with re-inkers, Hazel! 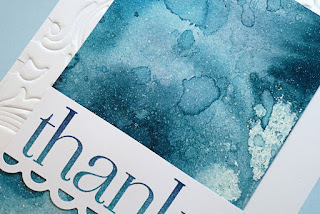 Love that background and the corner embossing is brilliant! Thanks so much for sharing this with us at CAS Mix Up! Love the shaker card too with all that gold! Very elegant and fun! Happy New Year, my friend! You are just so talented, Hazel. Love your cards today. Hope they win those challenges you've entered. :) I'm so happy that your mom is doing well, and I wish her all the best in the days to come. So glad to read your mum is better. Enjoy each others company as our parents are so dear to us, aren't they ? Two really beautiful cards Hazel and I love the piece you made with the reinkers. It's become a beautiful card. wonderful cards, Hazel - especially love the gold shaker. good to hear Mum is doing well and you also. HNY! 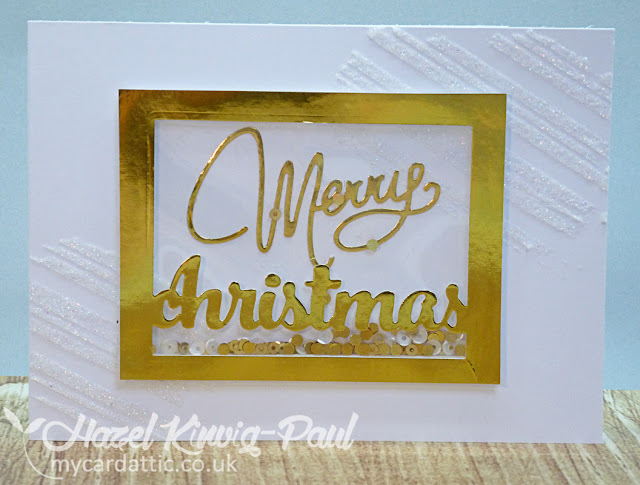 Two simply beautiful cards Hazel...love all that gorgeous gold and your blue card is stunning. Love that incredible background. Sending well wishes and hugs to your mum. I would say that you started the year with a bang by making two spectacular cards! The Christmas shaker is so festive and the blue background and the embossed die cut look fabulous! So glad to hear that your Mum is in a much better place! Happy New Year, Hazel! I'm so happy to hear that your mum is doing better! God Bless Her at 91...WOW!!! You have created two really beautiful cards ~ I love your gold foil shaker component on the first one, and how you added sparkle to your stencil! 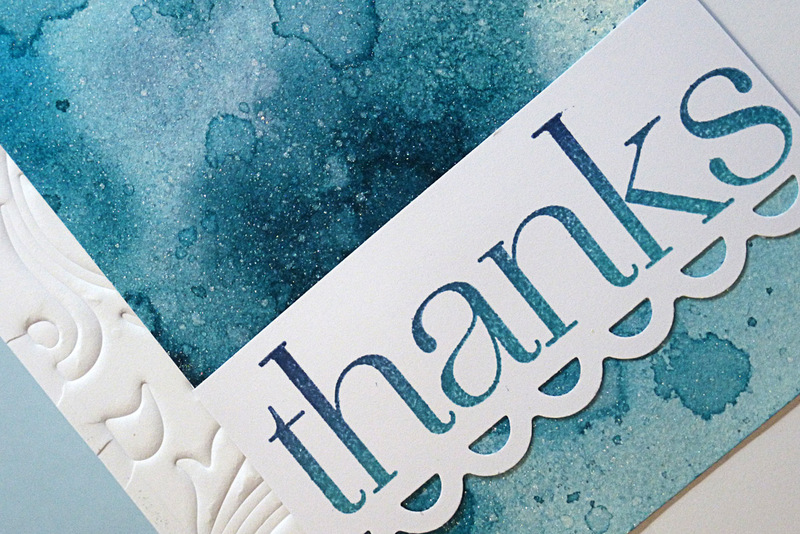 I also love how you created the panel with your SU re-inkers...so striking, and your partial embossing is perfect! I love your beautiful gold shaker card, Hazel, but that blue molten marvel just stole my heart!! How cool that you got the depth and interest you did with your reinkers! This is a total winner in my book!! What a stunning pair of cards Hazel! As ever, the blues are a firm favourite with me, but I love the depth and texture you got into that sumptuous white and gold creation. Wow! Two fabulous cards, Hazel! Love the look you got with the re-inkers! I might need to give that a try! Oh Hazel! Two wonderful card! The first card looks amazing with an additional dimension made by stencil, which is the background for the shaker. What an amazing idea! The second card is so wonderful watercolor background. I love the way you have done a background blanking die ... You're amazing.